Pour the toffee into either silicone moulds or a larger sealed, heat resistant brownie or cake tray that will fit into a larger tray to make a bay marie. * Allow to set. 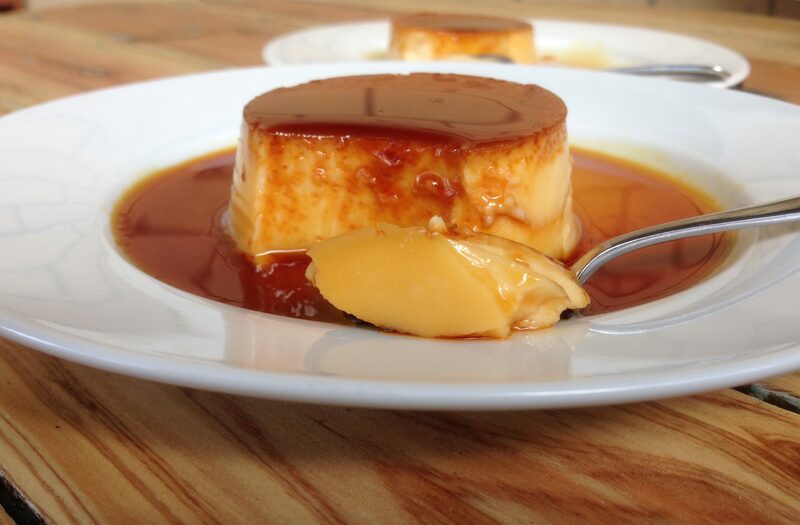 Blend eggs, condensed milk and evaporated milk together and pour over set toffee. Take the crème caramels out of the oven and allow to set overnight in the fridge. These can be made a few days in advance as the extra time allows for the hard toffee to melt and become the delicious, golden, caramel sauce. To serve just loosen with a knife around the edge and jiggle a little before turning upside down. Perfect served on its own or your choice of toasted flaked almonds, fresh strawberries, ice cream or whipped cream. I like to take the toffee as far as it can go without burning it. When you take it off the heat it will continue to cook so take it off a bit earlier than when you think it is ready then dunk in a sink full of water or just allow to rest. If it needs more cooking you can then return to the heat and repeat the process until you have the desired colour and flavour. A Bain Marie is simply a water bath that protects the creme caramel from some of the heat from the oven which would cause the eggs to scramble. If you are making these ahead of time then just cover in glad wrap in the fridge until read to turn out. It is a really great dessert for dinner parties as it is sure to impress and can be made so far in advance.